I just recently discovered some apps like Diptic, Collage and Instagram which enhance a photograph in different and amazing ways. 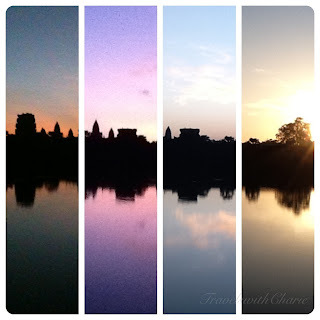 With Sunrise at Angkor Wat, I used Diptic to form a collage of various images I took at Angkor Wat last year to show the unfolding of day starting at around 5:30 a.m. until the sun crept into full view. It's beautiful to see the gradation of hues at intervals of just a few minutes. I refer to these images as "early bird catches early worm". In this photo taken at Bayon (also at the Angkor complex of temples), I used a filter from Instagram for a dramatic effect and to hide the haze at the lower edge of the photo. The frame further adds to the drama and sets the photo back in time. I describe this image as "a smiling face peeping through the corridors of time".